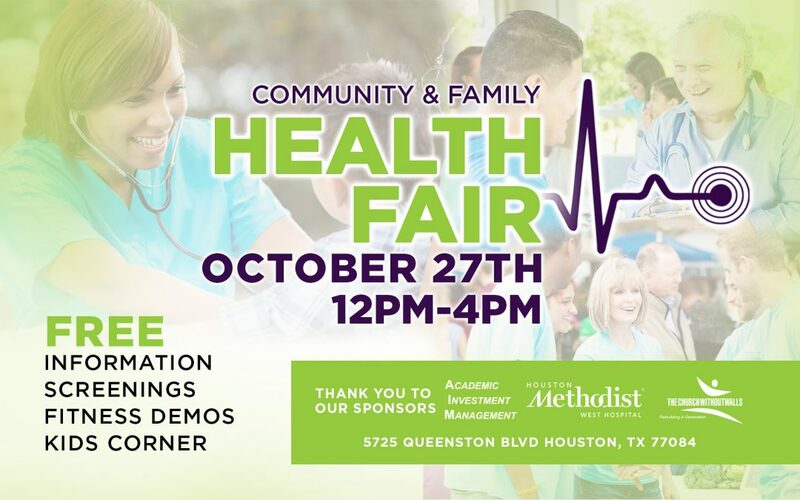 The Church Without Walls (TCWW) is hosting a free Community & Family Health Fair on Saturday, October 27, 2018, from 12 p.m. to 4 p.m., on its campus located at 5725 Queenston Blvd, Houston, TX 77084. Schedule time to ‘Ask the Pharmacist’ or ‘Ask the Attorney’ in a private, confidential setting. The Church Without Walls is partnering with many businesses and organizations that share its commitment to community health improvement, including our sponsors – Houston Methodist Hospital, Academic Investment Management – as well as many other community partners including Prairie View A&M University, Kelsey-Seybold Clinic, Walgreens and Gulf Coast Regional Blood Center. Through their involvement, The Church Without Walls hopes to bring even greater visibility to the lifestyle factors that affect a person’s well-being from childhood to adulthood. Dress comfortably for this family-friendly event where you’ll enjoy fitness demonstrations – line dancing, yoga, and boot camp – and a kids’ corner featuring a puppet show. There will be lots of door prizes, give-aways, and so much more! Be there! For more information click here to email TCWW Wellness Ministry or call 281.649.6800. Come Back to Church with us! An overload of summer activities can often interrupt your Sunday worship, Bible Study, and ministry work. Reconnect with a friend and come Back To Church on Sunday, September 16th to reengage with your church family at The Church Without Walls. As we attempt to get back to some form of normalcy after the devastation of Harvey, we have decided to suspend all ministry meetings, bible study classes, trainings, firm foundation, ministry and church-wide events, etc. for the month of September. All activities will resume in the month of October as we begin to celebrate our 30th Anniversary.